Here at Hilton Pond Center--in the heart of the South Carolina Piedmont--"fall" migration actually starts in mid-summer, with some adult male Ruby-throated Hummingbirds departing as early as the last week in July. (We've often wondered if these "early birds" are the ones that will fly farthest and end up in western Panama--the southernmost locale at which ruby-throats overwinter.) By the first week in September, the "fall shuffle" also begins, with non-migratory birds such as Northern Cardinals dispersing perhaps a few miles from where they were hatched. (As evidence, we caught six new hatch-year cardinals just this week.) The bulk of autumn migration, however, doesn't usually start until closer to the middle of September, so we were a bit surprised this week to capture and band NINE different species of parulids--making this a real WWW. In this case, we don't mean "World Wide Web," but "Wood Warbler Week." Wood Warblers (Parulidae) might also be called "New World Warblers" because they're not related to True Warblers (Sylviidae), hyperactive little birds primarily from Europe that misled early observers to think our American birds were in the same family. Our Wood Warblers may be small and active like warblers from the Old World, but they can't compete at song production; True Warblers are the birds that give "warbling" its name. With all that nomenclatural formality out of the way, let's get back to the results of WWW--Wood Warbler Week at Hilton Pond Center. A few warblers we netted in the past seven days may have been local birds engaged in a fall shuffle similar to that of our cardinals, but we suspect most were northern migrants just passing through on their way to the Neotropics. 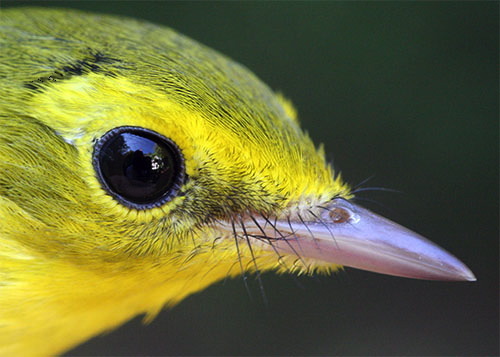 Five of the nine species, however, are known to nest in South Carolina's Upper Piedmont and could have been produced locally--including the Hooded Warbler, Wilsonia citrina. The two photos above are of a hatch-year male HOWA just beginning to get his hood in the form of a black diagonal line behind the eye. Hooded Warbler nests have been reported from the Broad River and Catawba River valleys on the western and eastern borders of York County, but we've never found a nest here in the central part. We saw our lifer "not-in-the-hand" Hooded Warbler at Kalmia Gardens in Hartsville SC in 1988 after catching and banding the first one here at the Center in Autumn 1985. To date we've handled just 45 HOWA locally, two-thirds of them--mostly juveniles--during fall migration. The American Redstart, Setophaga ruticilla, is an enigmatic species that may (or may not) breed nearby. 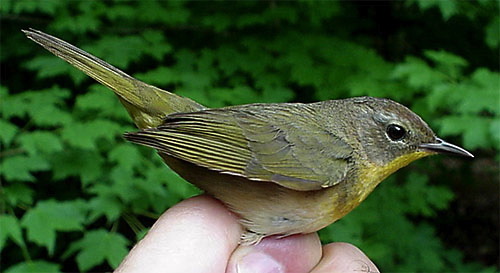 The redstart is among the most commonly encountered Wood Warblers at Hilton Pond Center, with 381 banded since 1982. (AMRE are exceeded only by Magnolia Warblers at 397 and the ever-so-common wintering Yellow-rumped Warblers at a whopping 2,045.) The majority of our American Redstart captures (65%) come in spring. Even though we've never netted a redstart between 6 June and 26 August, there are confirmed nests for the species in South Carolina counties just 30 miles to the east, with suspected breeding in the mountains 100 miles west of Hilton Pond. Some field workers think American Redstarts may be expanding their breeding range in the state, so we still have hope of adding the species to our "yard list" of breeding birds. Our capture this week was a juvenile male (above) with olive-and-yellow female-like plumage; adult males are jet black and orange. One species banded this week that almost certainly breeds on Hilton Pond property is the Louisiana Waterthrush, Seiurus motacilla (above); regretably, we've never found a nest for this big ground-dwelling warbler, but we HAVE caught mid-summer females with well developed brood patches--followed shortly thereafter by short-tailed fledglings that couldn't have flown far. 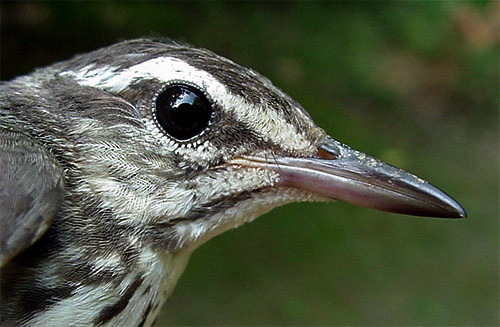 This species is sometimes confused with the very similar Northern Waterthrush that--as its name suggests--roams farther north into New England, across Canada, and even into Alaska. The two are easily told apart by the throat (unmarked, as above, in the Louisiana), eye line (buffy in the Northern), and by LOWA's distinctly larger bill. Even though the species nests locally, the Louisiana Waterthrush we caught this week may have been a migrant; its furcular depression--the area around the wishbone--was literally bulging with energy-rich yellow fat needed for long-distance migration. Closely related to the waterthrushes is another "drab" Wood Warbler called Ovenbird, S. aurocapillus, so-named because its nest is covered like an outdoor kiln. The species' brown dorsum and spotted breast are just the thing to camouflage this non-yellow warbler when it's foraging for insects on the ground. Ovenbird nests have been reported from locations scattered across the northeastern half of South Carolina--including Chester County that adjoins just to our south--but we've never had them after 19 May or before 23 August at Hilton Pond. They breed commonly throughout the eastern U.S. and southern Canada north of the Carolinas. 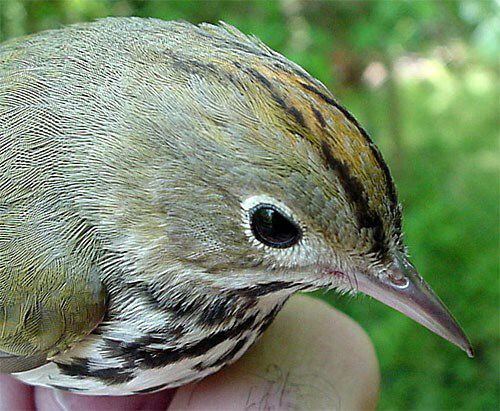 Since 1982 at the Center we've banded a respectable number of Ovenbirds--210--with 66% hitting our nets during autumn migration. Another heavy-bodied, short-tailed parulid that breeds across South Carolina is the Kentucky Warbler, Oporornis formosus. This bright yellow and black and olive species--to our eye one of the most elegantly marked of all the Wood Warblers--is quite uncommon at Hilton Pond Center. Based on overall plumage characteristics and the extent of its black mask, we judged the bird in the photo above to be a juvenile male. We've only banded 20 KEWA since 1984--nine in spring and 11 in fall--even though the species' greatest South Carolina densities are reportedly right here in the Piedmont. 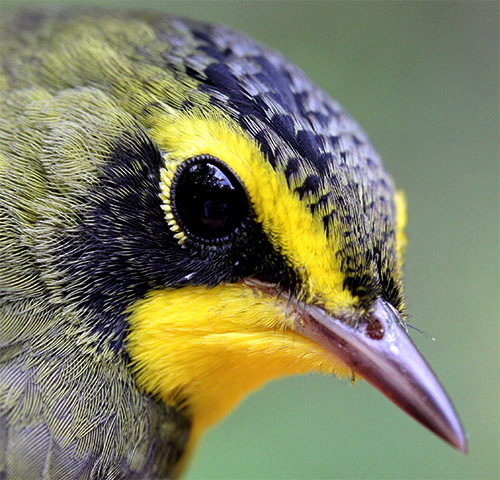 This week's Kentucky Warbler was likely on his way to wintering grounds between Mexico and upper South America. A pale juvenile Common Yellowthroat, Geothlypis trichas, hit one of our nets this week, but we neglected to take a photo before releasing it. The image above was taken several springs ago and depicts a very dark mature female--possibly a local nester. The yellowthroat is perhaps the most widely distributed Wood Warbler in South Carolina during the breeding season but, as noted for several local species, we've never found its nest at Hilton Pond Center. The COYE was once a very dependable Wood Warbler visitor; we banded 51 at the Center in just one year (1993), but only nine since 2003 and none at all in 2005 and 2006. This species may be in decline due to destruction of moist shrubby habitat it prefers AND because of nest parasitization by Brown-headed Cowbirds. In all we've captured 345 Common Yellowthroats in our 26 years at Hilton Pond, 71% of those in spring. 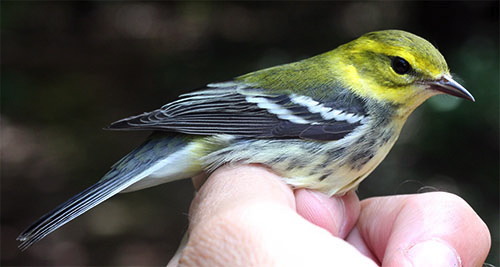 The remaining three Wood Warblers we banded this week at the Center have all been reported as nesting in the Palmetto State, albeit very rarely and--with one exception--only in the mountain counties above Clemson. All three are in the same genus, Dendroica, from two Greek words for "tree-dwelling." Indeed, the many species of Dendroica warblers are so arboreal they cause frequent neck pain for birders straining to watch them in the canopy. Members of this genus typically have tail spots and one or two wing bars, and almost all have at least a little yellow somewhere in their plumage. 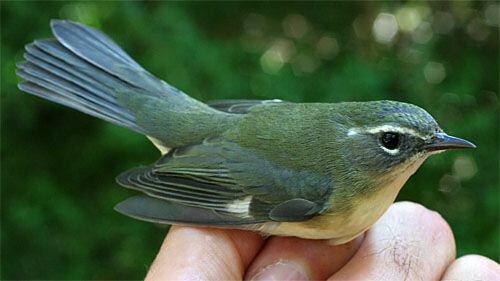 The first South Carolina mountain-nester on this week's Hilton Pond banding list is the Black-throated Blue Warbler, D. caerulescens, which does NOT bear yellow feathers. We realize the bird in the photo above also isn't blue and doesn't have a black throat, but that's because the this latest individual we caught happened to be a female. Other than size and shape, about the only field mark she shares with the male is a white wing spot. (The species name, Greek for "verging on blue," describes the adult male.) In BTBW the sexes are so different in appearance even John James Audubon initially thought they were two distinct species. Although there are a few nest records for Upstate South Carolina, you're far more likely to find this bird breeding up the Appalachians into New England and around the Great Lakes states. Locally, the Black-throated Blue Warbler is relatively scarce, with only 152 banded at the Center in the past 26 years; 57% were encountered in spring. Even less common among the mountain breeders that show up around Hilton Pond is the Chestnut-sided Warbler, D. pensylvanica, of which we've banded 72 since 1982. Interestingly, only 8% have been captured in spring, and nearly all autumn birds have been juveniles of both sexes (this week's young female pictured above). This disparity in numbers between spring and fall is reflective of the species' so-called "circular migration" route; i.e., in April and May CSWA migrate north across the Gulf of Mexico and up the Mississippi and Appalachian flyways but in autumn follow a southerly route closer to the Atlantic Coast, thereby cutting a big circle. We find it impossible to describe the almost-fluorescent yellow/green/olive hue of this bird's crown and back feathers, and it's almost as hard to photograph accurately. The Chestnut-sided is one warbler we wish everyone could hold, just to get a gander at its unusual plumage. Although all nine warbler species we caught this week were impressive in one way or another, our favorite has to be the Black-throated Green Warbler, D. virens. Not only does this bird have the longest common name of all our Wood Warblers, it's also one of the least common parulids here at Hilton Pond Center. Since 1982 we've banded only nine, all but one of those being unsexed young birds-of-the-year like the individual in the photos above and below. 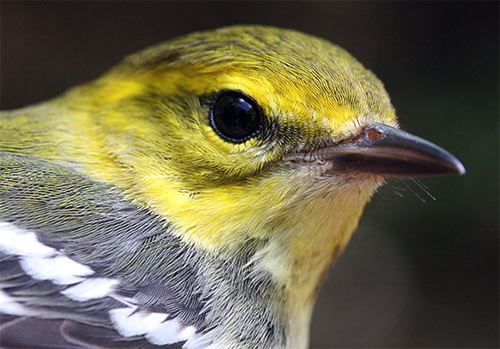 The adult male Black-throated Green Warbler develops an ebony throat and upper breast that belies its name; females gain a paler bib. There are a few nest records for BTGW in the South Carolina mountains; oddly enough, the species breeds more commonly along the coast--but not in between in the Piedmont. Like many Wood Warblers, the Black-throated Green more often spends summers in the Appalachians, throughout New England, and across southern Canada. So there you have it, the results of our 2008 WWW--Wood Warbler Week--at Hilton Pond Center. If the weather's just right and we're on-site for optimum migration days during the next few fortnight or so, we're liable to net several more parulids. During the past 26 years we've managed to capture at least one individual for all 35 Wood Warbler species that might reasonably be expected here in the Carolina Piedmont; in all, that's 5,076 parulids banded at the Center out of a total of 51,558 birds (9.8%). We'd like nothing better than to catch a few more of the rare ones so we can share another portfolio of photos while fall migration unfolds. Price ($21.50) includes U.S. shipping. 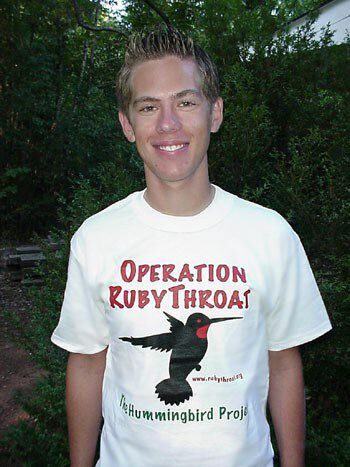 A major gift of $1,000 gets you two Special Edition T-shirts with "Major Donor" on the sleeve. --As predicted following the deluge (10.6") of rain following Hurricane Fay, dozens, no hundreds, no thousands--maybe millions--of mushrooms and other fungi have sprung up almost overnight at Hilton Pond Center. We're collecting photos and will offer them in a future installment of "This Week." --Another change brought about by last week's torrential downpour is that Hilton Pond itself is now almost four feet deeper, meaning the exposed mudflats and moisture-loving plants that took root thereupon are now under water. This provides a life-saving resource for tadpoles and fingerling fish that now have places to hide from hungry predators. We also found it interesting that for several days following the rain our population of Southern Leopard Frogs suddenly became quite active; after staying quiet all summer males began calling again, undoubtedly trying more time this year to attract the attention of potentially gravid females. We hadn't heard so much nighttime noise on our pond since the spring chorus back in April. --Ruby-throated Hummingbirds are still coming through in small numbers. Through 7 Sep we had banded 155--about 116% of where would would normally be on that date. We still have a sneaking feeling 2008 is going to end up being a down year.